The skull of medium width, approximately as wide as the length of the muzzle, resulting in an impression of length rather than width. Slight furrow between the eyes, cheeks cleanly chiseled. There should be a pronounced stop. From this point forward the muzzle is of good length, with the nasal bone so formed that the nose is slightly higher at the tip than the muzzle at the stop. Parallel planes of the skull and muzzle are equally acceptable. The muzzle should be deep without pendulous flews. Jaws ending square and level, should bite evenly or as scissors. Nostrils well developed and wide open. Ears-Set on at eye level. When hanging naturally, they should reach just below the lower jaw, close to the head, with little or no folding. They should be somewhat pointed at the tip-never round-and soft and thin in leather. Eyes-Of ample size, rounded and intense. The eye color should be dark in contrast with the color of the markings, the darker the better. Hindquarters: Muscular and powerful with great propelling leverage. Thighs long and well developed. Stifles well bent. The hocks clean; the legs straight as viewed from behind. Decided angulation is the mark of power and endurance. 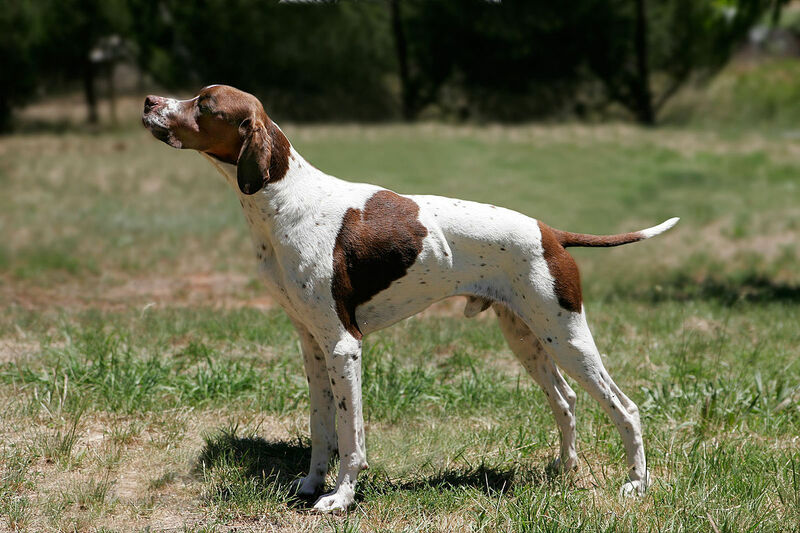 Click Here to Learn about breeder background checks on Pointer breeders if you are looking for Pointer puppies for sale. Click Here to learn how ResearchBreeder.com can help you find healthy Pointer puppies for sale. Click Here to order a Breeder or Kennel Background Check on Pointer Breeders that may have Pointer puppies for sale. Click here to find the national breed club for Pointer puppies for sale. Click Here to purchase a list of approved ResearchBreeder.com Pointer Breeders who have Pointer puppies for sale.